Longing for fashion-forward style and innovation in your home? 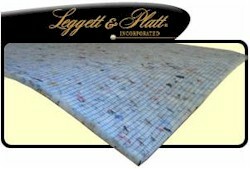 You can rest easy when you are surrounded with Leggett & Platt Consumer Products. We keep an eye on the latest trends in home design so we can give you the stylish, luxurious pieces that suit your individual style. Adjustable Bases – products that provide a path to tranquility, with an infinitely adjustable range of perfect positions. Beds – crafted beds, headboards, and daybeds that add a touch of style to your bedroom décor. Bedding Textiles – mattress and pillow protectors that provide an extra layer of protection to your bedding purchase and pillows for a sound night’s sleep. Bedding Support and Bed Frames – products that provide the proper support to your mattress and its foundation. Leggett & Platt Consumer Products are sold at specialty sleep, furniture, and department stores, as well as through online retailers, national chain stores, and specialty catalogs. Fashion Bed Group is the largest, and most innovative, supplier of fashion beds, daybeds, futons, bunk beds, bed frames, and bedding support products in North America today. Its beds are manufactured of genuine brass, plated brass, cast zinc, cast aluminum, steel, iron, wood, wicker and rattan.